Reacher 16 (#3), under jockey José Ángel Ambrosio, defeating Shadesofgreymagic(#1) in the $18,984(US) Mexican Futurity at Hipódromo de las Américas November 4. © Miguel Ángel Espinoza . MEXICO CITY, MX—NOVEMBER 8, 2018—Reacher 16, a half-sister to 2018 Remington Park Oklahoma-Bred Futurity winner Lynnder 16, defeated Shadesofgreymagic by half-a-length in the $18,984(US) Futurity Mexicano at Hipódromo de las Américas Sunday, November 4. With the rider José Ángel Ambrosio in the saddle, the two-year-old daughter of champion Inseperable earned $11,390(US). She completed the 400 yards in :19.55 seconds. Trainer José Ravel Baltazar saddled the bay filly for owner M.C. Cuadra Victoria. It was the fourth third win in four starts this season for the Oklahoma-bred filly out of Tinys Corona Queen by Corona Cartel. James E. and Marilyn Helzer is the breeder. The filly was a $4,700 Heritage Place Winter Mixed Sale graduate in 2017. The aforementioned Lynnder 16, a daughter of leading sire Apollitical Jess, is the leading money earning 2-year-old filly in the nation this year with three wins in six starts and $461,161. Shadesofgreymagic, a colt by Separatist form the Feature Mr Jess mare Jess Amy, picked up $ 3,795(US) for second. Scar Garcia Archundia saddled the grey 2-year-old for owner Valeria Cuadra. A. Gomez was riding. 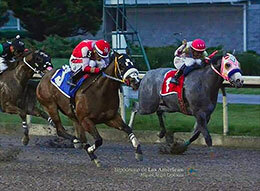 Tenayas Kid finished a nose back, under jockey E. Cuellar, for owner Armadillo Cuadra and trainer Marcos Mendez Renteral. The royally bred son of First Down Dash, out of Lady Tenaya by Sixarun, is a half-brother to champion sire Desirio. He earned $2,327(US) for the effort. Millennium Eagle, Amazing Grays, Here Come Da Money, Significant Legacy and Success Yall completed the field.